There is still a bit of time before it's officially fall. I've been holding on to summer with all my might! these past few days were all it took! I got the itch and added some fall flowers and foxes in the great room! and the flowers while thrifting with a sweet friend of mine. Cooler temps was all it took, I just had to pull them out! are you holding on to summer or are you itching for fall? 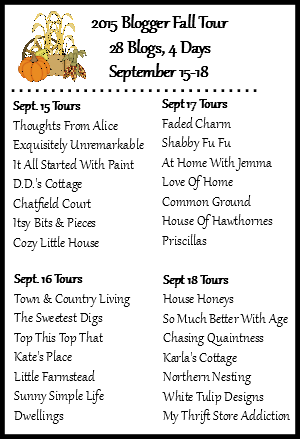 Mark your calendar for the Fall Tour of Homes! I'm itching for fall. It has just been so hot and I'm over it. The foxes are absolutely adorable! I'm itching for fall and I love your little foxes. 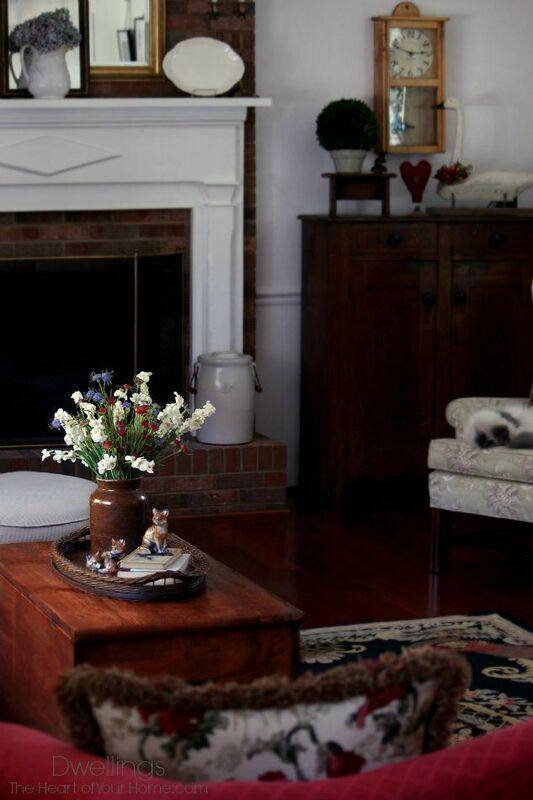 Love the vignette, it's so full of charm! 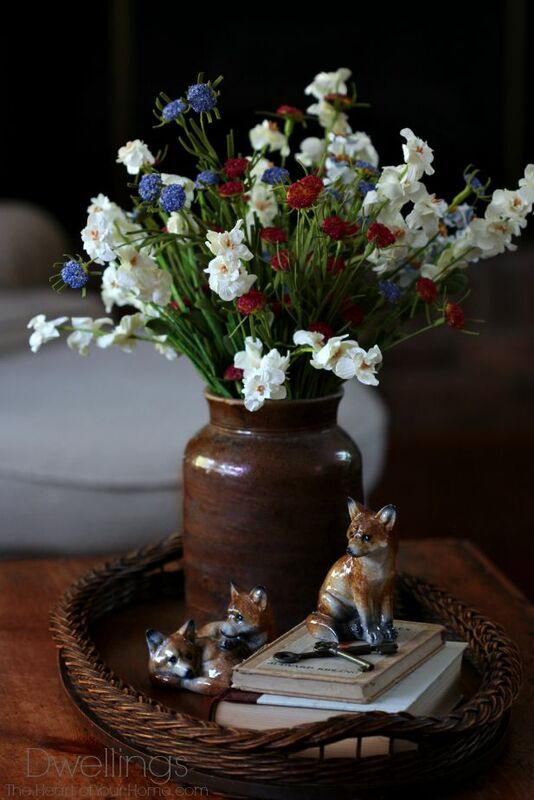 Great arrangement of flowers and oh, those adorable foxes, love them! I must go on, I'm so crazy about your trunk too! OH my, I'm so ready for fall! Im like you Cindy..I too want to hold on to summer! Ive heard that next week we are getting some really warm weather and I cant wait! Im visiting my sister for a few days at that time and she has a pool in the country. Woohoo her and I will be having some splash time. Lol ;) Oh my, I love that flower arrangement! And I love the container you chose to put them in...its perfect! Blessings on you Cindy and have a wonderful weekend! Pretty vignette Cindy, especially the flowers. Love those littles foxes. Summer is ending. I woke up this morning with the smell of rain. The days are starting to cool. I am so ready for Fall. I've gotten my place all decorated and it even rained a little this morning. Cooler weather here we come...I hope! 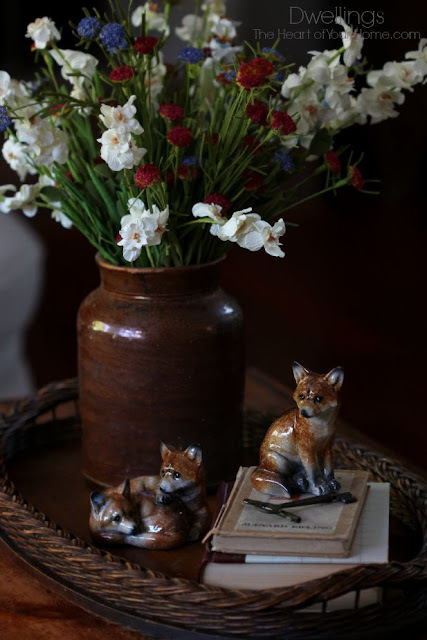 What a lovley blog, love those little foxes as well..sending you warm wishes from BC Canada! Love your vignette Cindy...those foxes are too cute! Love those precious little foxes! So cute! 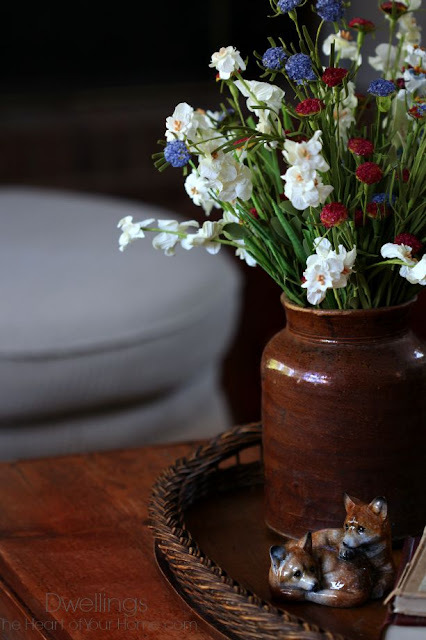 A sweet little vignette, and I LOVE the trunk it's sitting on! Hi Cindy, your Fall vignette is perfect. Those little fox figures are adorable and look great with the brown crock. Those are the cutest little foxes! Your table looks quite put together and eye catching with the vase of flowers, foxes, book, and keys. I am jumping into fall full force! I should be done by tomorrow night and hoping to share a little fall at the farmhouse soon. Have a wonderful week! Adorable fox family, dear friend!!! since moving to this side of the Prairie!!! It's lovely Cindy! Foxes = Fall for me! 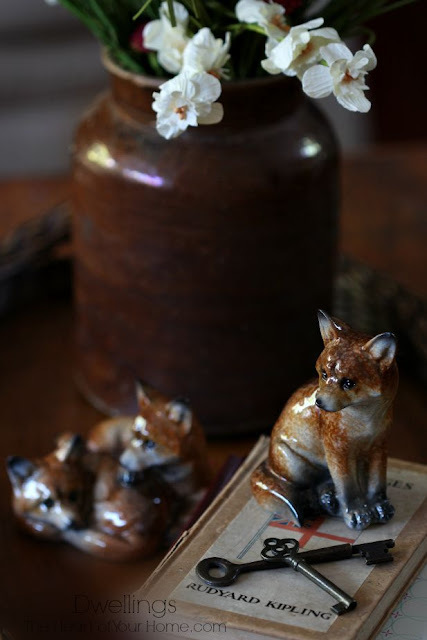 They are adorable...I have seen lots of fox decor lately for Fall....A great Fall vignette!! Love that touch of fall - I saw a fox roaming early this morning!